DETROIT — Ford Motor Co. has offered a first look at its upcoming Mustang-inspired battery-electric crossover through a sketch of the vehicle's backside. 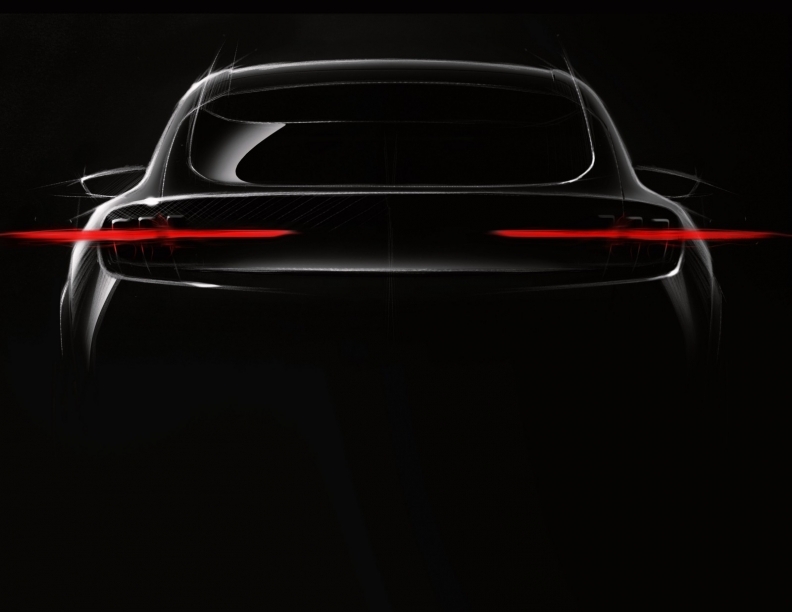 The teaser image, first shared with Forbes as part of a peek inside its design studio with CEO Jim Hackett, features a dark silhouette marked with the Mustang's signature three-bar taillights. The roof is higher than the standard pony car. Ford has said the vehicle, which will have a range of more than 480 kilometres (300 miles), will come out in 2020. Details of the vehicle have been sparse; Ford originally floated the "Mach 1" name, but Automotive News reported last month that the automaker is unlikely to stick with that moniker. Production was originally slated for Flat Rock, Mich., but Ford this year decided instead to build the vehicle in Mexico. "The stakes are high," Darren Palmer, Ford's Team Edison global product development director, said in a blog post Thursday after the Forbes story was published. "We are being tasked to set the future trajectory of the company, and Team Edison is up for that challenge." Team Edison is the name given to the group tasked with developing Ford's electric vehicles. Hau Thai-Tang, Ford's product and purchasing boss, earlier this year revealed that the design team made a late change to the crossover after a group trip to China, where they decided to enlarge the infotainment display screen after noticing customers liked the larger size on other vehicles. The vehicle will also debut Ford's next-generation infotainment system, Forbes reported. Ford said earlier this year it had created a dedicated group — dubbed Team Menlo, after the location of Thomas Edison's New Jersey laboratory — to develop the next-gen system. According to Forbes, Ford developed the Mustang-inspired design in a matter of six weeks after Hackett ordered a redo of the original EV concept, which he thought looked too generic.